Book Review: Armies of the Italian Wars of Unification 1848-1870 (1) by Gabriele Esposito. Gabriele Esposito might well be considered Osprey’s Grand Master of the Men at Arms series. His books cover a range of subjects in this series are as varied as uniforms and equipment of Roman infantry, to 19th century revolutionary armies in Southern Europe and South America. Italian history in Britain is dominated only by a couple of things. The Renaissance is the biggest presence on shelves, and then surveys of cities and now and then an art book, and within all that you tend to find mostly books about Medici’s and Borgia’s, Venice, Florence, the Popes and Rome. Personally I’ve never understood why the Risorgimento is so ignored in English. It’s just as confusing as the tangled story of 15th and 16th century Italy. It’s got just about as much colour, and yet mostly we have only heard about Garibaldi in Britain and nowadays I doubt many would know what he did beyond getting a biscuit named after him, least of all how the modern state of Italy came into being. I’m not writing this because this book tells that story, I’m writing it because books on this subject are thin on the ground and military histories of the Wars of Unification are even harder to find. So already I was looking forward to this book and I am happy to report that within the confines of its scope it is a very successful one. Although many claim that after 1815 there was a great period of peace in Europe, this is far from the truth, with Wars of revolution and succession sparking in Spain, Italy and even an abortive attempt to oust the Tsar in the 1820’s. It was a time of revolutions that turned Europe on its head and by and large created the 20th century European continent. This book offers and detailed overview of organisation (for the standing forces from battalion up to brigade level) and equipment and a decent coverage of uniforms, which given the varied subject at hand, that being of the Army of the Kingdom of Sardinia (Piedmont) and Naples (Kingdom of the Two Sicilies) in a conflict that stretched over the better part of 20 years, is impressive, but that’s where the talented brush of Rava takes over in a bright and vivid series of plates that display his mastery of atmosphere and characterisation, as well as his eye for historical detail. There are excellent studies of the famous Bersaglieri and Carabinieri, I love the painting of the Neapolitan troops sitting in the shade, drinking coffee out of little China cups. The photos inside include rare studio portraits of soldiers and well as period illustrations, a neat little book on a very interesting subject. The military history of South America is generally a closed book to most of us. Many will cast their eye over the list of conflicts that engulfed the continent with a jaundiced eye. Their politics don’t usually resonate, their General’s are not well known, much is written in a foreign language and the record of their soldiers is as enigmatic as the Andes. So it is with cheering clapping and many Vivas that I saw Gabriele Esposito’s titles appear on the upcoming list on the Osprey website. Starting first with tackling the armies engaged between 1860 and 1890 Espositio has written two men at arms titles to help introduce military history students to both the war of the triple alliance and the war of the Pacific. It is the latter that I gratefully received. Men at Arms titles attempt to cram in all the pertinent information about a given war, the soldiers that fought in it, and their weapons and equipment in a very short space. I felt that this one did this perfectly. The new subject that is poorly understood outside of South America lends itself perfectly to the format and it is packed with photographs, maps and hand drawings, in addition to the full colour artwork. One of the things that struck me about the conflict after reading the book was how well the small and hastily equipped Chilean army managed to achieve what it did. Had they been fighting for a more legitimate cause than a poorly concealed land grab, they would surely have accrued more praise for the conquest of Peru. Coming quickly after the surprise that Chile was to dominate military affairs in South America until world war 1, was the discovery that while Chile’s disciplined troops were nearly invincible in conventional battle her commanders seem to lack the flair of their opponents. 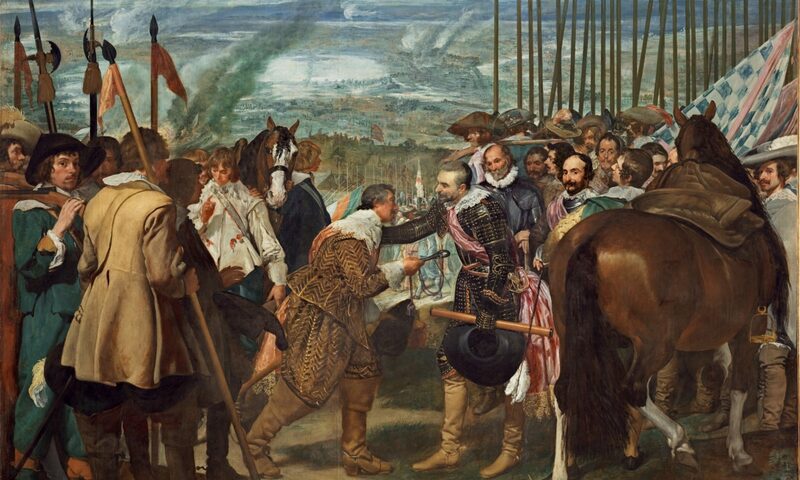 Very often an excellent army will breed competent rather than ingenious commanders, and an army like Peru’s much weakened after tumultuous civil wars, in fact provided two fascinating men, who became hero’s in their country. General Cáceras, and a naval man, commander Grau. The former was able to retrieve Peruvian dignity with his Quechua Guerrillas in the Andes, and the latter had been able with one ship, to delay the Chilean descent on Peru for weeks. Battles, tactics and equipment are all considered here, the forces of Chile and the allies (Peru and Bolivia) are all evenly considered, but Bolivia’s early exit from the war means that inevitable the decisive actions ended up between Peru and Chile. No one in the current pool of Osprey illustrators paints atmospheric action like Giuseppe Rava, hailed by most fans of the publisher as the heir to the much missed Angus McBride, his dynamic and often visceral style vibrantly adorns the uniform plates found in the middle of the book. He has had allot to work with for the South American armies were colourful looking things, especially that of Bolivia. 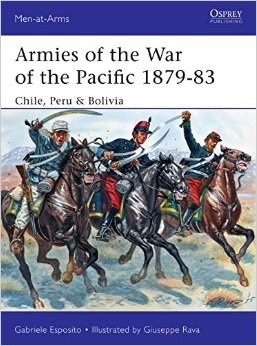 The War of the Pacific was the defining conflict to occur in western South America during the 19th century, and it is excellent to see books like this appearing. Here’s hoping some campaign books appear to back them up in the future.